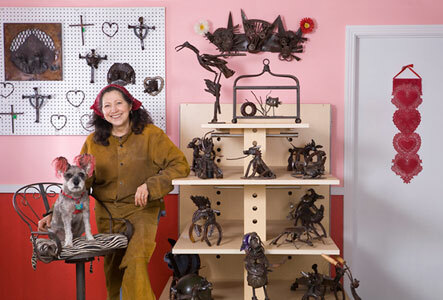 The sculptures of Tesi Sanchez-Halpert are welded bits and pieces of steel discards made new through her imagination, sense of humor and zest for life. They will arouse your curiosity, make you smile or laugh out loud and, along with the best of indigenous and folk art, inform. Sanchez-Halpert’s journey as an artist began with her childhood, growing up on a ranch in the Malibu hills. She and her siblings were encouraged to use their imaginations, to create playthings out of discards. Through a life-threatening stroke in 2004 and all the pieces of life in between, that nurturing childhood continues to inspire her work. In the beginning the constructions were simple, created to amuse herself and her friends. As she gained skill and confidence in herself as an artist, her concepts became more sophisticated and complex. She had a stroke in 2004 (at the age of 48) and re-learned how to weld. She now works with a greater appreciation for surface texture and patterns as they exist in nature. She is an inspiration, and to hear her story is a gift. Tesi Sanchez-Halpert’s documentation took place in 2009 and was sponsored by Pat and David Herman. The FOTM Archive contains extensive information about this artist.